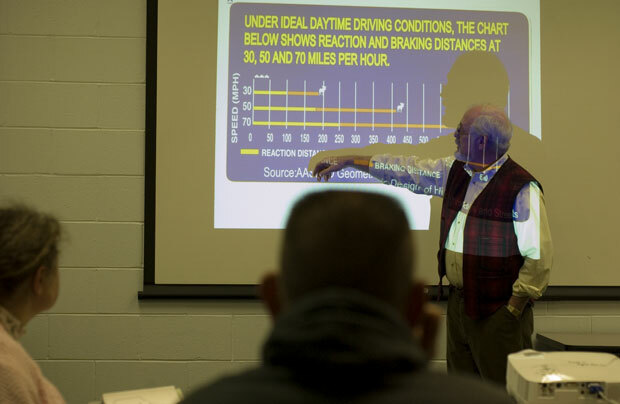 The instructor of a Maine Driving Dynamics Course given at the Augusta Technical Center refers to a power point chart displaying braking distances with the emphases on being able to stop for a moose. Could it be any worse than hitting a moose? Anyone can enroll, once a year, in the classes that are scheduled across Maine. For $60 you get five hours of class time that can both lower your insurance and take 3 points from your driving record. The classroom is empty for the five-minute break. A student attempts to walk a tape line wearing goggles that simulate vision under impairment.